Protect the Wilderking from the Veiled Heritance. Greenheart — Protect the Wilderking. Aranias and Andur were sent by the Veiled Heritance to kill the Wilderking. They are now forcing their way through Greenheart towards the Wilderking's throne. Go to Greenheart and follow the trail of fire. Place the Wilderking's crown in the garden at the top of the tower. "The Wilderking's reign draws to an end. The forest spirits have gone mad, even my own brethren … and he is powerless to stop them. Intruders enter Greenheart—dark and conflicted souls—they are the harbingers of the Wilderking's death." Is there any way I can help him? "I fear it is too late. Once events have progressed to this point, there remains little chance of reversing the process. Confronting the intruders would be beneficial, but even now, they blaze a trail of destruction toward the Wilderking's throne." "The woman Aranias and her companion Andur, the one who burns everything in his path. I am not sure which is more dangerous, but they must both be stopped if the Wilderking is to be saved. Cross the bridge and follow the trail of fire. Go quickly." I will find them and stop them. "Be wary. The Wilderking's influence ebbs, even here in Greenheart. The spirits of the forest are confused and angry—even my brethren—they will attack you with no provocation." "I am one of the Hollow. I do not know where we came from, but we are assigned to protect different parts of Valenwood. I am assigned to protect Greenheart, to ensure none can reach the throne of the Wilderking without his invitation." If your brethren here have turned hostile, why haven't you? "I do not know. The Wilderking send me here—to the entrance of Greenheart. I assumed it was to warn people away, but it may have been that he wanted me to greet you. Perhaps he placed protections on me to ensure I fulfilled his wishes." It sounds like you've failed in your duty. "We have not waivered in our duty. Any who came here uninvited were turned away. Strangely, the intruders who now seek to harm the Wilderking … he said they were invited.. [sic] You are invited too. The other Hollow only attack because they are confused." "It's good you're here. With earth magic and fire, Aranias and Andur force their way towards my throne, leaving chaos in their wake. I've lost control of my guardians. My power fades. I've always wondered what death would be like. Soon, I will know." You're just going to give up? "My end was inevitable all along. Someone new must become caretaker of the Valenwood. Aranias was guided here for this purpose. It's fascinating. In her heart, I think she knows the truth, but she's conflicted. Perhaps it is Andur's influence?" What should I do to change that? "I think you should catch up with them. Follow the trail of fire. Aranias must choose to accept the responsibility of her own accord, but Andur will not understand. I expect he will oppose her and she will need your help to defeat him." Then I will try to catch up quickly. "Quickly. Aranias waivers. She knows now why she was guided here—not to destroy the Valenwood, but to save it. She wants to change course, but she's afraid. She's afraid to stand up to Andur." "Aranias' powers grow as she draws closer to the throne. She opened the ground here and they entered the Throne Tunnels. You must follow. You must be there to help Aranias when she decides to make her stand." Don't worry. I'll be there when she needs me. [Persuade] It would help if your forest spirits weren't attacking me. "My hold over the creatures of the Valenwood has weakened. That is why they panic and attack. I lack the strength to pull them back, but I can make it so you appear less threatening. Be careful though. This enchantment will only last a short time." "If Andur kills me before I pass the mantle to Aranias, there will be no caretaker of the Valenwood. The forest would become a voracious monster. It would turn against the Bosmer and ultimately bring about its own destruction. You must stop him." Aranias: "I won't let you kill him, Andur!" Andur: "Get out of my way, girl. I have no patience for this!" Keep following the path, until you find an injured Aranias near the mouth of a tunnel filled with fire. "It's you …? From Silatar? My … my friend. Thank the Eight! You were right about the Veiled Heritance. I'm sure now. They used me as bait to trick the Wilderking, and now Andur's going to kill him. I can't let that happen. I have to stop Andur." "I don't know, but somehow, it seems like that's what I was meant to do all along. When he burned the forest, I actually felt its pain. I think I'm … connected to this place. I can't fight Andur though—he's too strong. Will you help me?" Of course. Where is Andur now? Aranias: "He's gone ahead. I can travel through the roots to catch up, but you will have to fight your way through. This might help. Use this bundle of roots and you can burrow for short distances. It will at least get you past Andur's fires." She'll immediately vanish into the ground, saying "I will protect the Wilderking as long as I can, but you must hurry." 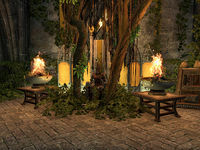 Enter the tunnel, but avoid the deadly flames—you'll be able to activate Aranias's bundle of roots to burrow under them. There are two stretches of flames that you will need to do this for. Watch that you don't take too long underneath the flames, as there is a time limit to the roots. Once you exit the tunnel, you'll have to return to following the path, fighting off the Hollow that guard it. When you reach Andur and Aranias, they'll be locked in a magical battle—Andur seeking to kill her and the Wilderking, and Aranias defending. You'll have to tip the balance, so defeat Andur, whose final words will be "Will there be no end to these interruptions?" Once Andur is dead, Aranias will greet you curtly with instructions: "Quickly. The Wilderking is weak. I must get him to the tower. You should come too." She'll take them both to the nearby Throne Tower, and you will follow. "Aranias was guided here to take my place, but I believe you were guided her to assure her ascension. 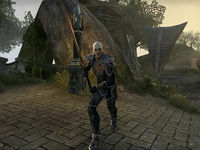 If you had not come, I fear Andur would have killed us both, leaving the Valenwood wild and vengeful. Many lives would have been lost." So Aranias will now become the "Wilderqueen?" "Yes. For centuries, my sole focus has been shaping and maintaining the Valenwood, protecting it from outside influence, and from itself. Now that she has come, I am free to return to the earth, give back to that which has given so much to me." "She is up above. You should go to her. She is frightened of the transformation process, but you must comfort her. This is the natural course of things. It is necessary for her, and for the Valnewood, but she must choose it of her own accord." The Wilderking's final words will be "Goodbye now. It's time for me to rest." To the left of him, you'll find a ladder to the central room. "I'm scared. Shouldn't I be feeling confident? I mean, we defeated Andur. Look at all of this though! I've worked my magic on small pieces of land in the Summerset Isles … but this is an entire forest … a living forest. Tell me I can do this." "I think he was once a man too, once, the Wilderking. I mean, he was like us. But when he took this on, he became something else. I think he merged with the Valenwood and forgot his previous self entirely." Yes. His name was Ostion. He was an Altmer mage. "And he doesn't even remember that! The same will happen to me. If I accept this responsibility and become Wilderqueen, I'll forget my home, my youth … everything." "Well yes. It means that once I accept this responsibility and become Wilderqueen, I'll forget my previous life, my home, my youth …everything." From what I witnessed, those weren't exactly glorious memories. "No, but they are my memories, and some of them fond. The ones with you. They seem only partially real, but they're the memories I'll miss most. I have to let go though. The way I embrace you in my heart, that's how I must embrace the Valenwood." Are you ready to become the Wilderqueen then? Aranias: "Yes, but I need your help. You must climb the tower further and place the Wilderking's crown in the gardens there. Then you must wait for me. Promise you'll wait." "Go on. We need to do this before I lose my nerve." "Everything is so … very different. It's like I'm no longer a single physical form, but my being is spread out across the forest. Aranias is slipping away. You are my friend though, whoever I become. Will you stay for just a moment?" "I am prepared to lose my memories, but I don't want to lose the lessons I've learned. You helped me understand the difference between a foe and a friend. I'm determined not to forget that, nor to forget you." She will give you Ashenblade and a Skill Point. 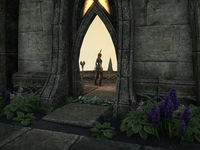 "I know why you originally came here—to ask for the Wilderking's allegiance to the Aldmeri Dominion—to know the Valenwood was on your side. Would you still make such a request to me now?" Yes. Queen Ayrenn sent me to ask your allegiance on her behalf. "And I freely give it. On behalf of myself and the Valenwood, you have our allegiance. I only hope Ayrenn realizes her best ally stands before me now. Before Aranias' memories fade though, there is something else I must tell you." "It's the Veiled Heritance. As you may know, they stole the Staff of Magnus. I know not where they've taken it, but you should search in Woodhearth, to the west. I will open a portal to the western gate of Greenheart. Goodbye, my friend." Thank you. I'll go to Woodhearth. "Go to Woodhearth. Trouble stirs from our common enemy." I should follow the trail of fire to search for the pair. The Wilderking has appeared on the path. I should speak with him. The Wilderking says he's dying and that Aranias is destined to replace him. He believes she will have a change of heart and I will need to help her fight Andur. I should follow the trail of fire to catch up to them. The Wilderking has appeared in my path. I should speak with him. The Wilderking says he's dying and that Aranias is destined to replace him. He believes she will have a change of heart and I will need to help her fight Andur. I should follow them into the Throne Tunnels. The Wilderking says he's dying and that Aranias is destined to replace him. He believes she will have a change of heart and I will need to help her fight Andur. I should follow them through the Throne Tunnels. The Wilderking says he's dying and that Aranias is destined to replace him. I finally caught up and discovered that she's turned against Andur but needs my help to defeat him. The Wilderking says he's dying and that Aranias is destined to replace him. Aranias has indeed had a change of heart and now seeks to stop Andur. I need to follow her and help her defeat him. The Wilderking says he's dying and that Aranias is destined to replace him. Aranias has indeed had a change of heart and now seeks to stop Andur. The Wilderking says he's dying and that Aranias is destined to replace him. Aranias has indeed had a change of heart and now defends the Wilderking from Andur's wrath. I must defeat Andur to save them both. Andur is defeated and Aranias has taken the weakened Wilderking to the tower. I should join them there. I should speak to the Wilderking. The Wilderking says that he will soon die and that Aranias must accept the responsibility to take his place. I should speak to her. The Wilderking is dying and Aranias has accepted that she must take his place. She's asked me to place the Wilderking's crown at the top of the tower to allow for her transformation. The Wilderking is gone, and Aranias has assumed the mantle and become the Wilderqueen. I should speak to her. This page was last modified on 8 March 2018, at 09:38.